Manila, Philippines - Smart Gilas Pilipinas wins against So. Korea, 86-79 in the FIBA Asia 2013 semi-finals round held on Saturday, August 10, 2013 at the Mall of Asia Arena, Pasay City. After a very tough match, Philippines now enters Finals and secured slot in the FIBA World's Championship Cup 2014 in Spain. Jimmy Alapag, the Philippine Team Captain is the savior of the game shoots two 3 points to secure wide lead over So. Korea, 84-79. Alapag and Ranidel De Ocampo delivered the biggest baskets with Marc Pingris personified the big fighting heart of the Filipinos, who won despite missing Marcus Douthit who was injured in the second quarter. Gilas Pilipinas coach Chot Reyes cries, 'tears of joy' as the game closed, 86-79. "Our motivation coming into this game was simple: get into the finals and make the Philippines proud. I told the boys, let's expect to win the game; and not talk about the past. ", Reyes said. According to reports, the last time that Philippines made an appearance in the FIBA Basketball World Cup was in 1978. Crowd in the Mall of Asia Arena, with 18, 631 attendance goes wild as Gilas Pilipinas rush to drive the game on top of expectations. Team Philippines regained lead in the semi-finals during the opening of the third quarter, 40-39. So. Korea scores better on the first-half round. Aguilar scores inside; 58-51, Philippines with over 3mins left in the second period. 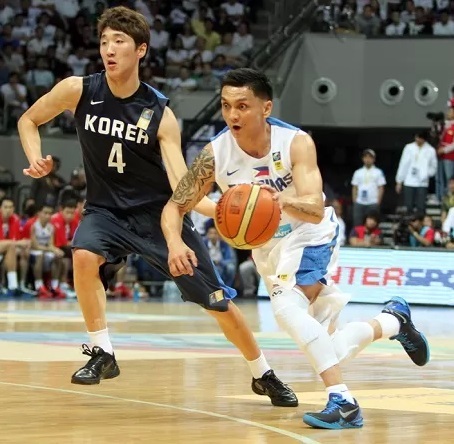 Gilas made it to a double-digit advantage when Jimmy Alapag released a 3-point shot. Japeth slam to end the third quarter. Gilas ahead 65-56 heading into the final frame. Team Philippines is set to battle with Iran tomorrow, August 11, 2013, 7:15 PM at Mall of Asia Arena for the FIBA Asia Championship match. Earlier today, Iran won match against Chinese Taipei on the semis,79-50. Philippines (86) - Castro 17, Pingris 16, Alapag 14, De Ocampo 11, Tenorio 9, Aguilar 8, Chan 5, Foancier 2, Norwood 2, Douthit 2, David 0, Fajardo 0. Korea (79) - Kim M. 27, Yang 11, Kim JS. 11, Lee S. 10, Lee J. 10, Cho 6, Kim S. 2, Kim T. 2.